Kensington_Wilsons 1926_287, a photo by gtveloce on Flickr. 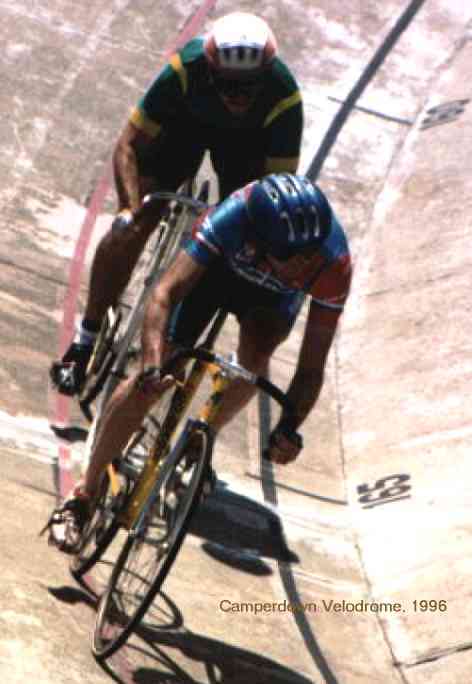 Last one on Kenso, and it's the racecourse that became a university - of NSW, to be precise. Kensington racetrack was a pony course adjacent - probably too close - to the Randwick horse racing track. 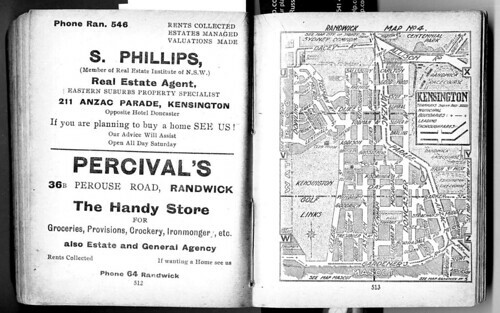 Randwick won out politically and the Kensington ponies were shifted south to Ascot (or Mascot, if you like). The Old Tote building became a theatre under NIDA and the rest of the land became the UNSW. 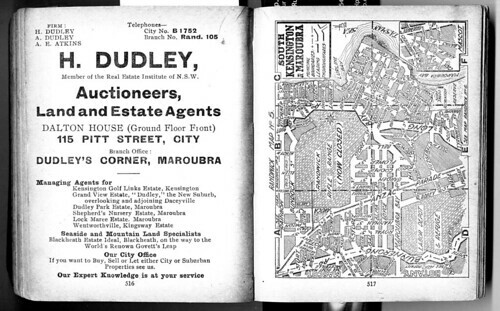 There are also some interesting tram formations on this 1926 map, including the Dacey Ave line and the loop on the other side of Anzac Parade from the racetracks. Kensington_Wilsons 1926_288, a photo by gtveloce on Flickr. Lots of changes here since 1926. Long Bay Road becomes today's Malabar Road and the trams have gone, of course. What is now Heffron Park is not yet split by Fitzgerald Ave and plenty of houses are missing. Also the old Randwick rifle range has yet to shrink or lose its tram link (along Araluen Street, below). Long Bay_Wilsons 1926_289, a photo by gtveloce on Flickr. 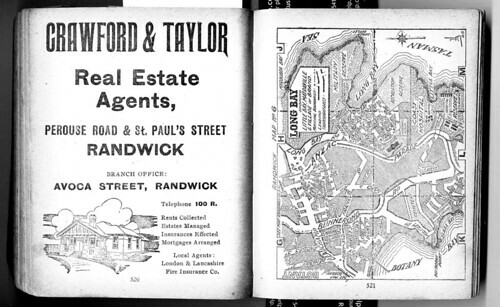 Nice advert for a dream home in Randwick... wonder if that house still exists? St Peters_Wilsons 1926_290, a photo by gtveloce on Flickr. Note 'King Street' for today's Princes Highway, the dam at the Cooks River and the cricket ground on King St near Station Street. 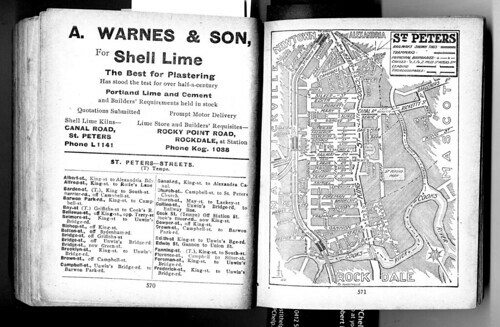 Also the advert for lime from kilns on Canal Rd is interesting. An interesting historical note about Narara, the sunken steamer off Barrenjoey - not the suburb. Or is it? A snaky tale of ships and sea... well, in part, anyway. In summary, "Narara" appears to mean "black snake" in local Aboriginal language and it is a name that has adorned a ship that sank off Barrenjoey as well as the Gosford suburb. I note that Wikipedia hasn't updated its spelling of Barrenjoey since 1909... perhaps that is the preferred spelling? The Narara was a wooden carvel screw steamer built in 1900 at Jervis Bay, that was wrecked when it sprang a leak whilst carrying general cargo between Sydney and the Hawkesbury River and was lost at 2 ml SE off Little Reef Newport near, Barranjoey, New South Wales on the 29 May 1909. The vessel commenced her runs from Sydney Harbour to the Hawkesbury River in January 1900 and continued on this run till the time of her final 1909 sinking. During 1903 the vessel was burned to the water line and sank at its mooring only to be refloated and rebuilt and started back on the same run.